Those two dogs were just the right color, the right snap. I even scored them beforehand so as not to wrestle with a pressure cooker plump. A fast lunch. I was due by 2 p.m. My last meal at 8:30. Really looking forward to something I hadn’t eaten in years. 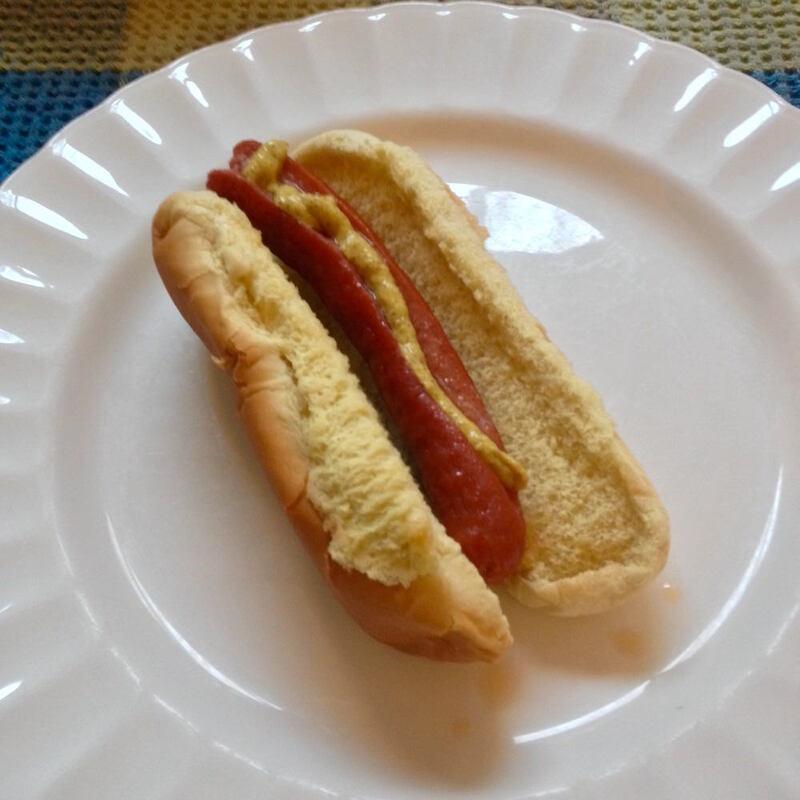 Hot dogs are fattening. Loaded with preservatives. You don’t need meat anyway. The more cons that surfaced the more my desire increased. I could taste the salt, even before. And I could smell the whole wheat bun I threw on top of the simmer-height burner. Old style toasting. I recall my grandmother used to toast like this—easy, simple—though her toaster, the upright two-sider with hinged doors was just as primitive. A red hot coil—make it horizontal, it’s the same thing. I ran back and forth from stove to fridge. What to go with? Certainly dark mustard…left over coleslaw? No, too creamy. Something with bite. Ahh! The thick-sliced sweet onions that never made it to the grill. Throw in a pan. Already seasoned and oiled…brown and steam at the same time. Recalls the fried onions in tomato sauce the New York vendors sold with their dogs. Timing—look alive—dogs steamed, bun with dark spots smoky in the nostrils. Lifting the lid…hot steam rising to wet my face. Onions making sizzles, the water gathered on the lid drips down. Cover again. Moisturize the thick melting into translucent rings. First bite. I missed this. All the familiar flavor. I deserve this. Lights up the buttons…I have the other one in the pan but no bun. I’m proud of my restraint. This entry was posted in Blog and tagged writing prompt. Liz Nathan has been with the Philadelphia Writers Workshop since June 2015. Liz is currently working on poetry and vignettes which she hopes will become short stories. A visual artist from New York, now living in Devon with her husband and a big mutt, she loves being open to spontaneous streaming thoughts and compiling these into daily witness.